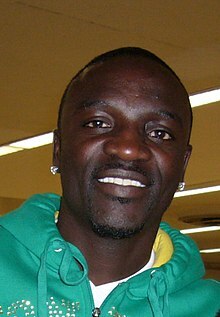 Aliaume Damala Badara Akon Thiam (born Aprile 16, 1973), better kent as Akon (/ˈeɪkɒn/), is an American sangster, sangwriter, businessman, record producer an actor o Senegalese strynd. ↑ 1.0 1.1 "Akon - Music Producer, Songwriter, Singer - Biography.com". Retrieved 2016-08-30. ↑ "Archived copy". Archived frae the oreeginal on December 24, 2015. Retrieved 2015-11-09. Wikimedia Commons haes media relatit tae Akon. This page wis last eeditit on 10 September 2018, at 14:46.